wonder why many of the most famous writers in the world descend from Ireland. 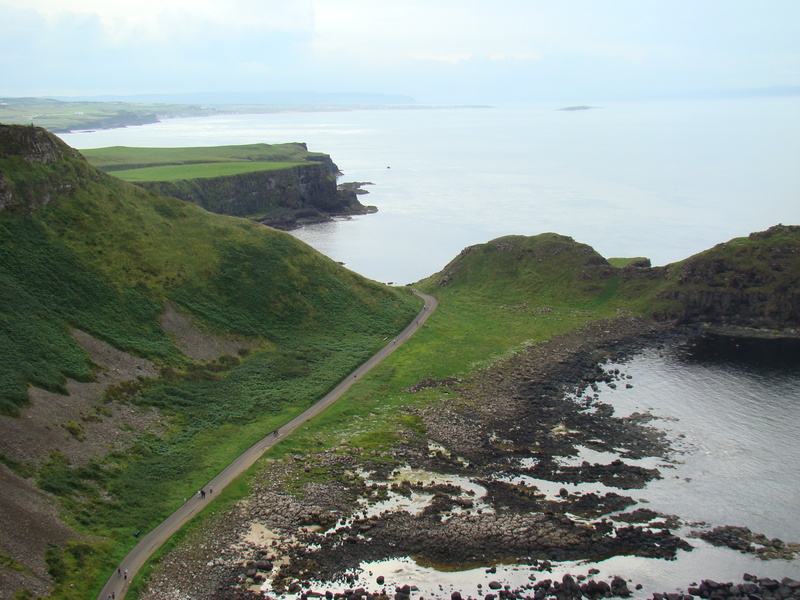 We road from Dublin to Galway, up through the town of Sligo, in the north of Ireland, straddling the Garavogue River, and on to Londonderry before going even further north to reach the causeway. 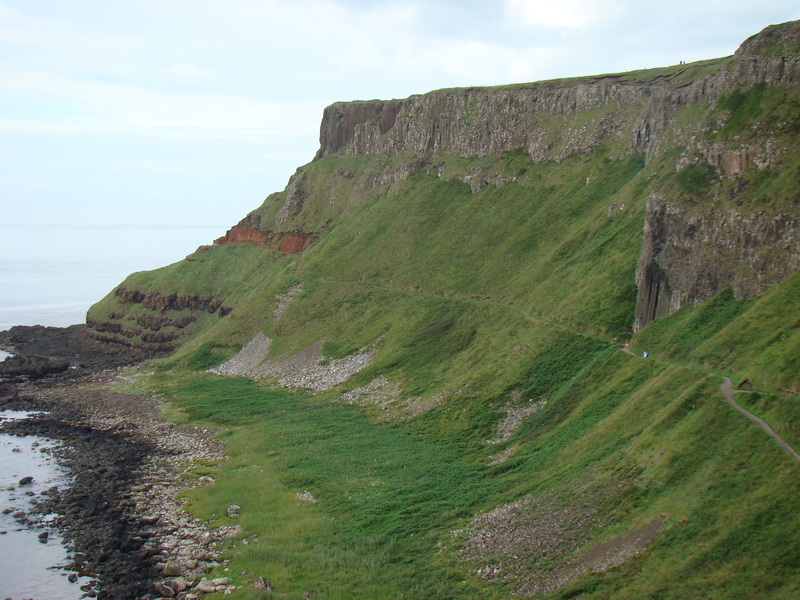 The north is known for its literary heritage and rugged countryside. The roadway combs the majestic cliffs and the sheer beauty made me question whether I was awake or dreaming. The fresh air was invigorating and I kept the window down the entire drive. The ride was like a journey through the ages. Forsaken castles stood next to modern homes and ancient cliffs were littered with new walkways. There was spectacular beauty around every twist and turn in the road, and that was all before we reached the Causeway. I felt lost in a moment in time. It was the first day during our trip to Ireland that it did not rain. 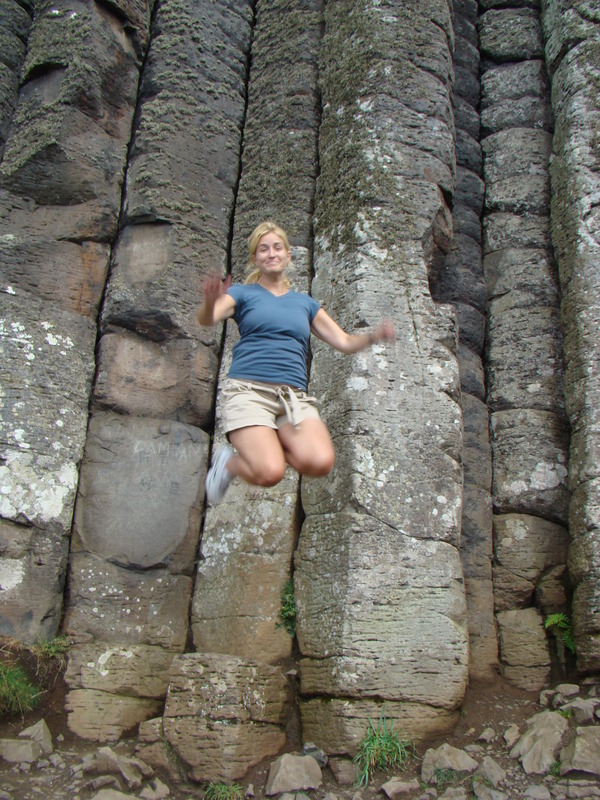 We reached the Giant’s Causeway by 3:00pm, which gave us lots of time to explore the cliffs and check out the columns. 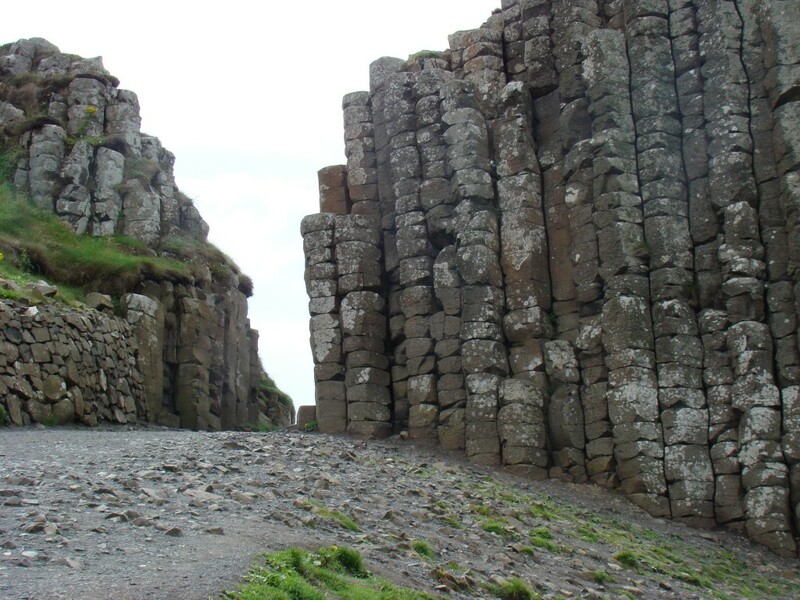 The parking lot for the Giant’s Causeway was full. There was an array of vehicles including vans, motorcycles, cars, trucks, motor homes, and scooters. There was a €5 parking fee, but it was free if you were willing to walk ½ mile from the main road. We could see from the parking lot that it was a fair walk just to get to the causeway so we paid the €5 to avoid the extra effort. Our journey started at the visitor centre where cheap quality products were sold at bank-breaking prices. We quickly veered away from the centre and headed for the road toward the water and the main attraction. 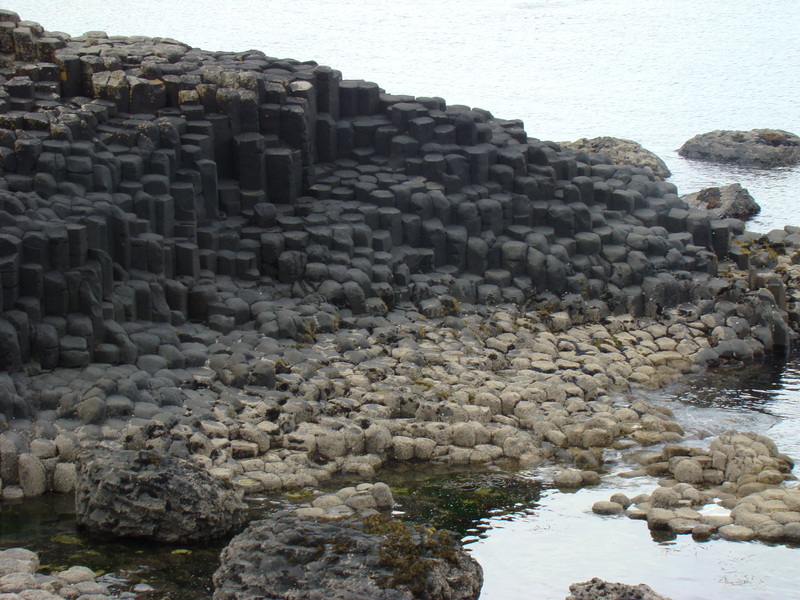 The Giant’s Causeway was a cluster of over 40,000 black rock columns formed 60 million years ago. Each column looked like a perfectly cut, hexagonal step. I marveled at how it could have possibly happened. It really was one of nature’s wonders. I watched the families and friends as they too were awe struck at the scenery. There were hundreds of pictures being taken at that moment. It was like being on the red carpet at an awards night. I always laugh at people that act like they are photographers. They take pictures at all kinds of different angles, they lay on the ground, they hold the camera upside down, and they snap off picture after picture of the same thing. Photography is an art and some people have an amazing eye for it. I am not one of those people. 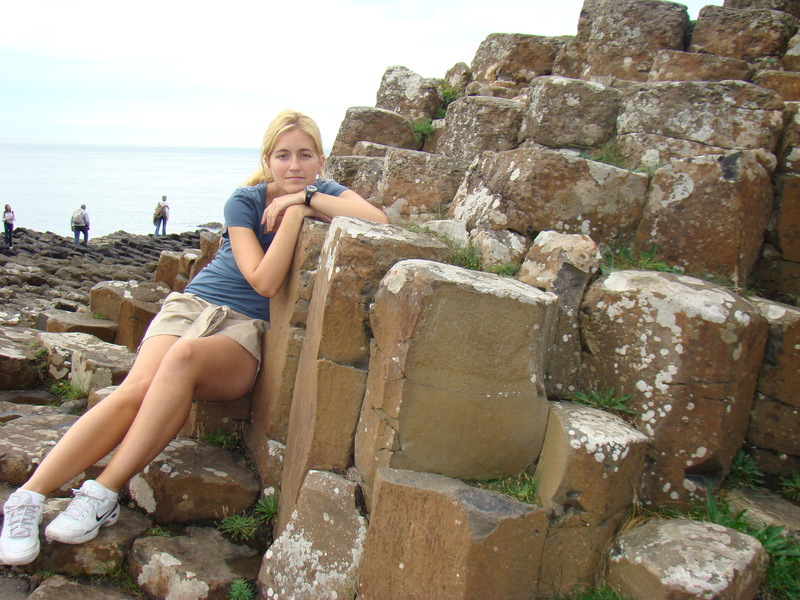 At the Giant’s Causeway, I was one of the people that annoy me so much as they pretend to be photographers. In the end, it was hopeless, and my pictures didn’t show the beauty of the Causeway. I couldn’t even capture the enormity of the rocks. I guess I should stick to my day job. I took about 75 pictures at the Causeway. 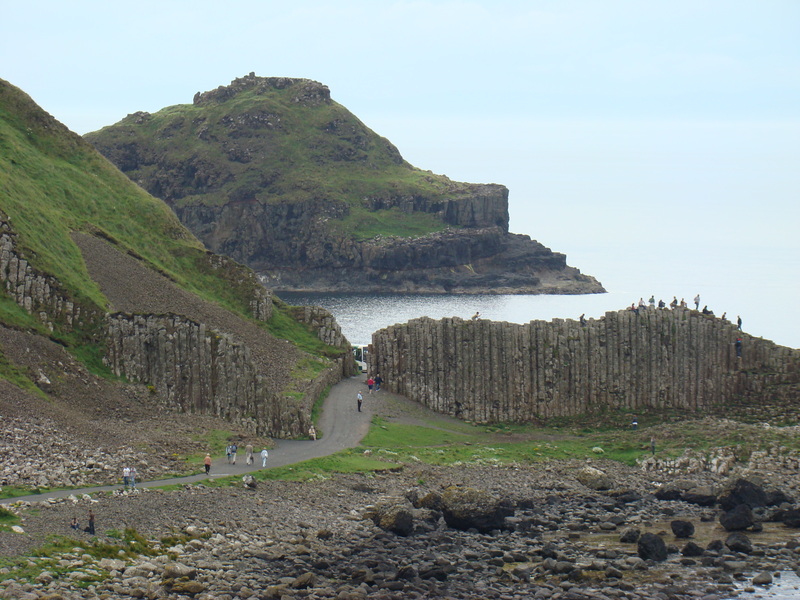 Once the Causeway was conquered, we walked through the Giant’s Gate and continued up the cliff pathway towards a rock structure called the Giant’s Organ. 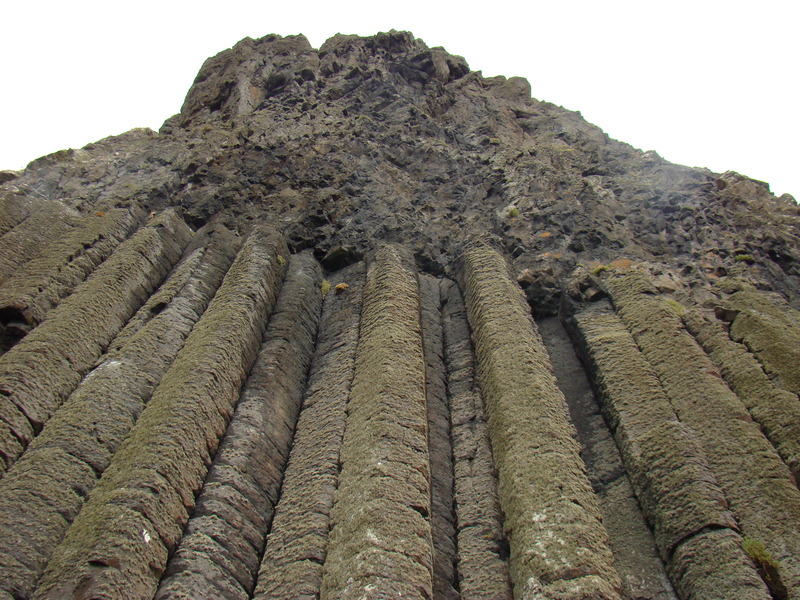 The organ was made up of tall, hexagonal columns set in the steep hill slope. My husband opted for the corny picture of pretending to play the organ, but I wanted something more. I saw a column that was set height and I stood on top of it. I told my husband to take a picture as I jumped in the air. I was hoping it would look like I was falling off of the cliff and I got what I wanted! As I was coming down from the three foot jump off of the two foot rock, my leg buckled under me and I came crashing to the ground. I thought my arm might break with the pressure from the fall so I tried to roll onto my side. The only thing I succeeded in doing was hurting myself more. My legs hurt and my arm felt like it was twisted. The blood started forming around my knee and spreading down my leg. AHHHHHHHHH! That was so stupid. I might have broken something. I need stitches in my leg. I started to laugh at my own stupidity and my husband was relieved that he could finally laugh. He was trying his hardest not to laugh just in case I was seriously injured, but the smile was forming on his face before he was fully sure. He reached for my arm and said, “Are you okay,” only after snapping off a picture of my cut leg and the tears forming in my eyes. It was really not that bad of a fall and I was not in need of any medical attention. It was nothing that a band-aid couldn’t fix, but it was sore and we were only in the middle of the cliff. How am I going to walk out of here? The hill is steep and the stairs are winding up to the heavens. That was such a stupid thing to do. It was a long, hard walk up the hill. The steps were far apart and each one made me cringe. My knee was bleeding; my arm ached. I tried not to cry as people passed me on the steps. When I made it to the top, I looked at how far down we actually were. If the fall had of been any more serious, I wouldn’t have made it up the hill. I was not disappointed as we drove away from the Giant’s Causeway. We spent a few hours there and we walked most of the trail. Even if I hadn’t of hurt myself, the rest of the path was closed because of erosion. The drive was spectacular and it was nice to see the ocean. It was a breathtaking day, in more ways than one. For someone who doesn’t seem to consider themselves a photographer I’m impressed with what you’ve managed to capture. Regardless of studying catering near the Causeway, in Portrush, I didn’t visit here often enough. It’s quite extraordinary how people will stare and invariably count how many sides there are to the stepping stones. It’s a truly unforgettable place; and glad you loved it. Shame about your fall, though. It was too bad that I fell, but I really enjoyed my visit to the Causeway. It’s something that you really need to see for yourself to believe and understand the beauty. I hope that I can take my daughter, and my husband, there in the near future. How long were you studying in Portrush? Are you from Ireland? Yes, I was born and educated there. Fled, though, as soon as I could and eventually made it to London for 26 years! Doesn’t seem that long. Was fortunate to take a couple of people that I used to know from Vitoria-Gasteiz, in Northern Spain to the causeway – they adored the place! And everywhere we took them. Thanks for your visits, btw. Do you prefer living in London? I enjoyed my visit there, although it wasn’t as long as in Ireland. 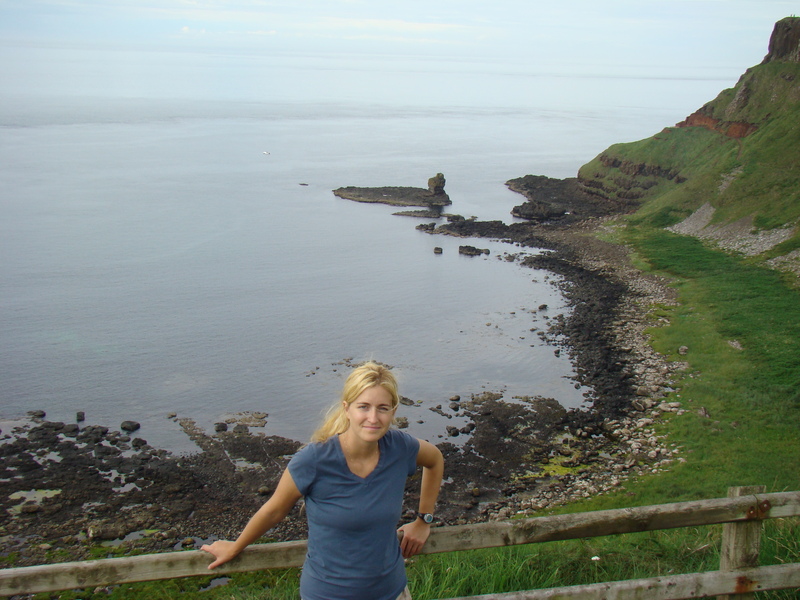 As an English teacher, the Globe was one of the most memorable experiences of my life. No longer live in London. In Margate at the moment – although, I prefer to tell people that I live near France! Nice, France was one of the most relaxing, beautiful places that I visited! It was a great mid-backpacking stopping point. I was able to catch up on my tan and some interesting sights before heading to Italy. 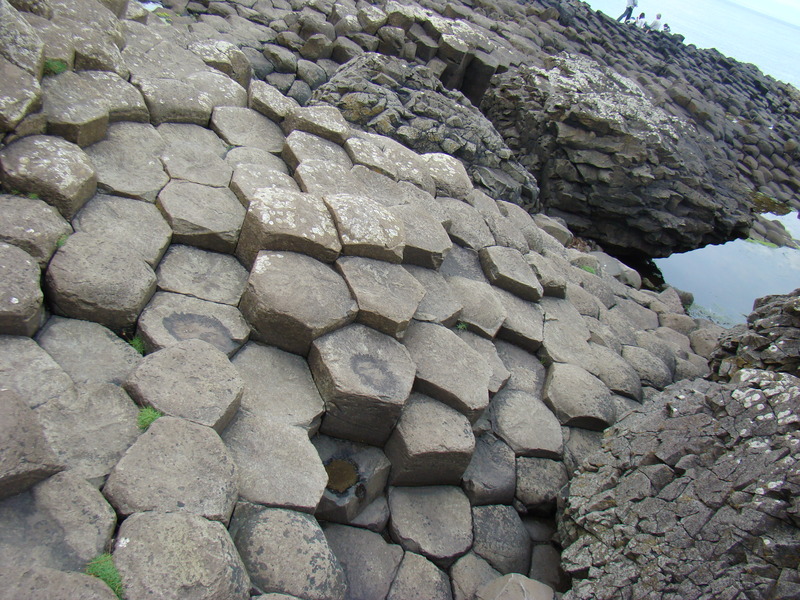 The Giant’s Causeway is incredible! We went there and I look forward to going back. I love your pictures! Did you see more of Ireland as well? I tried to make it to all the major cities, but Ireland has so much to offer. I know what you mean about really trying to capture a place in photos. Sometimes I’ve looked back and been so disappointed with the results. I guess that’s where words come into their own. You’ve done a great job with both in this post and it’s a fitting Patrick’s Day tribute. Wish I had been. Ireland is an amazing country! Well worth the visit.